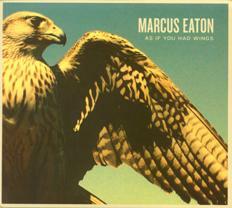 George Graham Reviews Macus Eaton's "As If You Had Wings"
It's interesting to consider how some artists and bands try to maintain a similar sound through successive albums -- especially if there was a hit involved -- while other artists make an effort to seek out different sounds and musical contexts each time. I suppose many fans do like artists who are consistent and make more music like their previous hits. But I think that the artists who have more durable careers are those who can explore new musical avenues over time, thus avoiding getting into a rut. This week we have a new recording by a very creative artist who has taken a somewhat different approach on each of his recordings -- actually three regular studio CDs so far -- while maintaining a consistently high level. He is Marcus Eaton, and his new project is called As If You Had Wings. Full disclosure: I have gotten to know Marcus, and he has appeared twice our Homegrown Music series here at WVIA. But since he lives far away in Idaho, and I had previously reviewed his music long before our collaboration, perhaps that will provide a little patina of journalistic credibility. Marcus Eaton is the son of a guitarist and songwriter, and with limited availability of television where he grew up in Pocatello, he took up guitar an early age. In college in Boise, he had a band which eventually led to a group called the Lobby which released a CD in 2003 called The Day the World Awoke. It was a fresh-sounding and fascinating blend of acoustic-guitar based music with the rhythmic and compositional complexity of art rock, the lyrical approach of a singer-songwriter and an occasionally jazzy sound driven by a saxophone in the group. Eaton himself is an impressive guitarist, running from rock to flamenco in style. He cites early influences from Paul Simon to Bob Marley to Dave Brubeck in his music. After the Lobby album, not much was heard from Eaton on this side of the Rockies for some four years when he released a solo album called Story of Now in 2007, which built on Eaton's fascinating, musically and rhythmically complex and yet appealing music with the help of some other musicians brought in for the CD project. There was a somewhat more produced sound. Eaton said he used the services of a vocal coach and his already likable tenor vocals were given more depth. Meanwhile, after the release of Story of Now, Eaton began touring extensively as a solo artist with his acoustic guitar and a battery of looping effects that created impressive arrangements from the devices and his virtuosity on the guitar. He often performed opening for Tim Reynolds and was a big hit among live audiences. He was also doing new material. It was in this solo setting that he first appeared on Homegrown Music here at WVIA in 2008, in which he played some of the compositions that would eventually end up on the new CD As If You Had Wings. Eaton began performing with a trio with Los Angeles drummer Kevin Rogers, and bassist James Munson who played with Eaton in the Lobby. The new CD features drummer Rogers, and on bass Garrett Sayers. With the band being a tight touring unit, this time Eaton decided to create a recording that is something similar to how the band would play live, with minimal overdubbing. Eaton notes that virtually all the sounds were made with his guitar and effects devices. So the texture of the new CD is in some ways more direct and basic than 2007's Story of Now, and after being noted for his compositions which were often in unusual time signatures, the music on this CD is a bit more rhythmically conventional but still with interesting twists. So As If You Had Wings is more oriented toward the songs and the guitar work, both of which are impressive. Eaton remains an appealing vocalist, and an articulate lyricist who is not afraid to revisit that most frequent of songwriting topics, love. But he always gives it a distinctive spin to fit in with his layers of musical complexity. James Taylor, whom Marcus Eaton cites as an influence, once recorded a song called You Can Close Your Eyes. Eaton ends his CD with a track called You Can't Close Your Eyes. In a previous review, I called him a kind of "art-rock singer-songwriter." This track epitomizes that creative mixture. It definitely one of the more electric tracks on the CD. Idaho-based composer, guitarist and vocalist Marcus Eaton's new album As If You Had Wings is another outstanding recording from an impressive artist who combines musical sophistication with great guitar work with appealing songs. And on what is basically his third studio album in almost eight years, he again takes a somewhat different direction than on each of his previous recordings -- this time emphasizing a more straight-ahead live trio sound -- and Eaton can be pretty remarkable live -- after a more elaborate studio oriented album and one with a previous band. The sound is rather different each time, but the music has been brimming with interesting ideas. Our grade for sound quality is close to an "A." Except for the multiple effects that Eaton uses on his guitars to create everything from atmospheric sounds to all-out rock guitar, studio effects in the mix are very understated, which helps also emphasize the live nature of the music. And the dynamic range is decent for a rock album. On his new CD, Marcus Eaton has again affirmed his position, in my eyes, as one of the most creative and musically interesting people on the rock and pop scene these days.